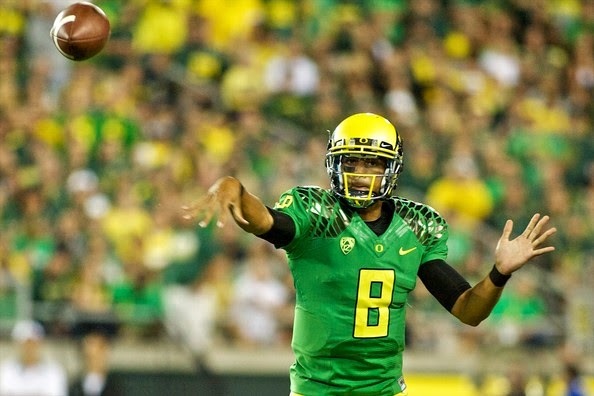 Oregon quarterback Marcus Mariota has the chance to avenge an earlier loss to Arizona, send the Ducks to the College Football Playoff and take another step toward winning the Heisman Trophy this weekend in the Pac 12 Championship Game. Championship weekend has arrived, and seven teams still have a realistic chance to qualify for the College Football Playoff. They will all be in action this weekend, and six of them will face off against top-16 teams. Certainly, they will all need to work hard to stay in playoff position. The Big 12 is the only power conference in college football not to hold a conference championship game. Unlike the other power conferences, all 10 of the Big 12's teams play each other every year. The conference has “One True Champion” as its slogan, but Big 12 commissioner Bob Bowlsby has backed off from promoting that slogan in recent weeks. Generally, the Big 12 uses head-to-head as a tiebreaker between conference co-champions to determine who will represent the conference in a bowl game. But this year, the CFP committee has consistently favored TCU in its rankings, despite a head-to-head loss against Baylor. Conveniently, Bowlsby has stated that, in the event of a tie this year, the conference will simply name co-champions and leave the rest up to the committee. AD: Oregon has lost only 3 of its last 27 games dating back to 2012. Two of those three losses came at the hands of Arizona, including the Ducks’ only loss so far this year. Oregon will be looking for revenge on Friday night. Quarterback Marcus Mariota is the Heisman frontrunner with 36 touchdown passes and only 2 interceptions, but Scooby Wright III and the Arizona defense know how to make things difficult for him. Mariota, normally known for taking care of the ball, has committed multiple turnovers in every game he has played against Arizona. The Wildcats’ opportunistic defense should keep them in the game again. JP: Vegas does know that Arizona beat Oregon the first time they played this year, right? I think the Ducks get redemption, but with the Wildcats playing as well as they are, I just can't give up more than two touchdowns against them right now, no matter who they're playing. AD: When is the last time a team lost two quarterbacks with Heisman potential to season-ending injuries in the same year? It doesn’t happen very often, but Ohio State lost two of the nation’s best players this season. Braxton Miller injured his throwing shoulder early on, and replacement J.T. Barrett broke his ankle last week against Michigan. Now the Buckeyes must turn to inexperienced third-string sophomore Cardale Jones. Jones faces an unbelievable amount of pressure to play well this week. Even if the Buckeyes win, they will likely be excluded from the playoff if Jones does not perform at a high level. Ohio State may have a better résumé than another contender, but if Jones does not show that he is an adequate replacement for Miller and Barrett, the committee will leave his team out. Jones will be thrown into the fire immediately. Wisconsin is a formidable opponent led by Melvin Gordon, the nation’s best running back. It’s hard to know what Jones is capable of, but keeping pace with Wisconsin’s offense will be a difficult task. JP: As good as Barrett was as a true freshman, there were some definitive growing pains, most notably Ohio State's now-confusing loss to Virginia Tech. Even if Cardale Jones is a Barrett and Braxton Miller-level talent, I doubt he'll be ready to perform at a high enough level to keep up with Wisconsin's powerful ground game. AD: Missouri has played one game against a top-25 team all season. That game came in October, when current No. 14 Georgia traveled to Missouri and beat the Tigers 34-0. Playing the nation’s best team on a neutral field will be an even bigger challenge for Missouri. The Tigers exceeded expectations by winning the SEC East, but the SEC West is the far stronger division. Alabama should demonstrate that on Saturday. JP: Missouri lost to Indiana. Seriously, that's all you need to know. AD: TCU is the only playoff contender facing an unranked opponent this week. Iowa State is 0-8 in the Big 12 and shouldn’t be able to put up much of a fight against the Horned Frogs. But despite their horrendous record, the Cyclones have played respectably against some ranked teams, so they should at least be able to stay within five touchdowns of TCU. JP: I always hate spreads like this, because you're basically betting on how long TCU coach Gary Patterson feels like playing his starters. My thinking is TCU coasts early and he rests his regulars to get ready for the playoff. Florida State has won its last three games, all against unranked opponents, by a total of twelve points. Two of Georgia Tech’s last three opponents have been ranked, and the Yellow Jackets won those three games by a total of 61 points. Georgia Tech is the hotter team and will be Florida State’s toughest competition so far this year. Jameis Winston thrives on grinding out tough games in the fourth quarter, but this should be yet another nail biter for the Seminoles. I may go down with the ship betting on FSU to cover, but screw it. They've gotta blow out SOMEBODY this year, right? I'm already regretting this pick. This top-10 matchup has the feel of a conference championship game. The CFP committee has favored TCU over Baylor largely because of TCU’s impressive win over Kansas State. If Baylor can win this game emphatically, its résumé will be very similar to TCU’s. Then Baylor’s head-to-head win over TCU might finally come into play. But at the moment Kansas State is playing better than Baylor. The Wildcats crushed their in-state rival Kansas by 51-38 last week while Baylor squeaked by Texas Tech 48-46. If Texas Tech could come that close to beating Baylor, Kansas State should be able to as well. I really like the Wildcats, but Baylor needs to win, and needs to win BIIIIIGGG this week if it has any chance of making the College Football Playoff. With the game in Waco and a ton to prove, I look for the Bears to put on a show.